You can provide LOB contacts proactive visibility into events that impact service level agreements (SLAs), including: web browser access with detailed dashboards, alerts and notifications about process failures and issues, single-click problem interrogation and the ability to create a rule based on current query. You can take advantage of continuous controls monitoring with near real-time notifications. 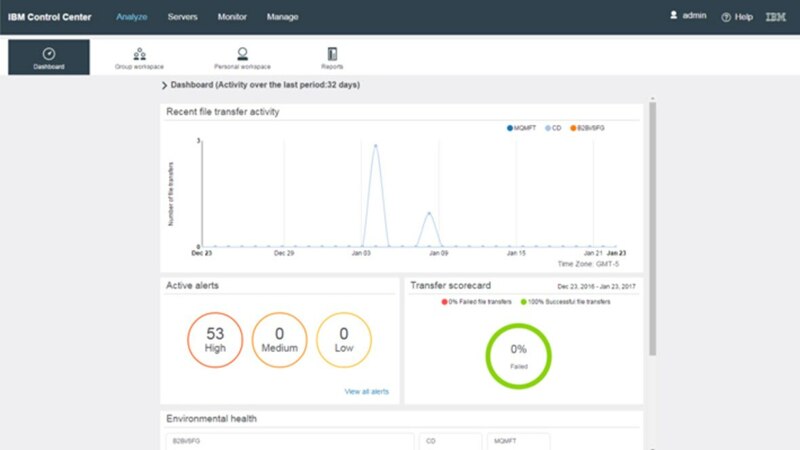 Manage IBM Sterling Connect:Direct and IBM Control Center configurations, including change controls. Consolidate and normalize file transfer and process data from managed servers into a single SQL database. Capabilities also include embedded reporting for operational audits and proof of transactions. Enables you to create and delete configuration objects, and update multiple servers across different platforms. Also provides syntax checking and full text searches. Maintains distinct versions of objects that can be retained for auditing or restored, and provides an audit log that includes changes to configuration objects, showing changes and who made them. Libérez vos échanges de FTP, protocole peu fiable ; réduisez vos ressources IT.